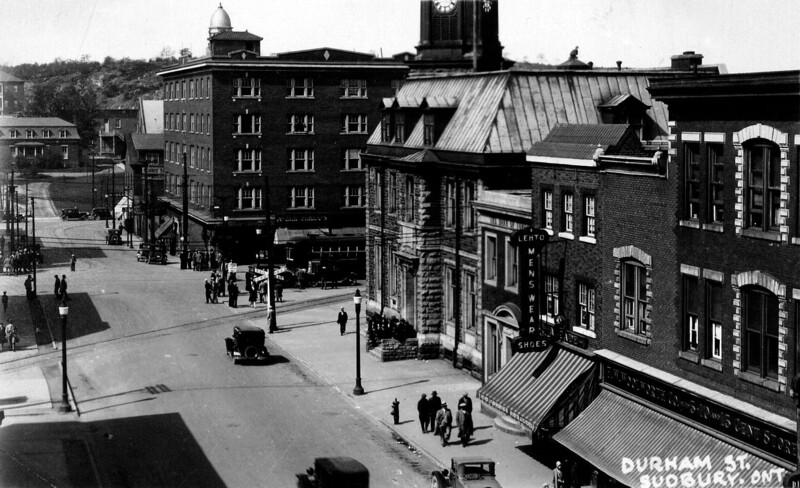 Downtown Sudbury 1930s. The post office is on the corner. The railway track came down Durham. The first memory I have is running and playing in an empty lot, and I think it was off Frood Rd., in the Donovan. It represents a time in my life when my mother was running a rooming house to help meet the needs of the family. Dad was as an insurance agent. It was the Dirty Thirties. My mother was from Western Ukraine, the part that was under Poland at the time. During the Great War, she remembers soldiers in the village. She spoke about it but not very often. I know very little about my dad’s upbringing. He was from Western Ukraine as well. So my family has had a close and long connection to Sudbury and Northern Ontario. I was born in the north end of Winnipeg. That was when Dad retired from mining. My parents bought or leased a corner store there. During the Depression, customers of the store got behind in their payments. The store went bankrupt and they had to close. Dad’s savings accumulated as a miner working in Northern Ontario, Quebec and B.C., were invested in the Manitoba Wheat Pool. When that collapsed during the Depression, he lost everything. He was offered an opportunity, because he was familiar with Northern Ontario, to work as a salesman for Beattie Washers in that area. He left his family in Winnipeg and he was located in Timmins or Kirkland Lake at the Beattie Washer Shop. He could speak Slavic languages and sold washing machines to the wives of immigrant miners. He was a top salesman for Beattie Washers in Canada. Because of his reputation, he was approached by Metropolitan Life to sell insurance in Sudbury. He wouldn’t have to travel around, so he was able to have his family join him. We arrived in Sudbury when I was about two. The first memory I have is that boarding house in the Donovan. The other early memory I have is when we lived on Eyre St. A photographer stopped at the door, and asking if we wanted a photograph. I don’t know if I have that picture. But I remember a picture of myself sitting on the donkey, and one sitting on a chair. Mother befriended a Jewish haberdashery salesman from Toronto. She would sell on consignment men’s clothing: socks, underwear, shirts, and ties. She would sell this to the boarders. She made a couple of pennies this way. Later she became an Avon salesperson; she sold cosmetics door to door. I remember she would get packages, and it would be like Christmas opening the orders that should would have to be delivered. Then she worked for Sporella corsets. Sometimes the women would come to the house, and I could peak in and see mother fitting the corsets. Mother also cleaned the old Regent St. theatre. She would get free tickets. My brother Taras and I saw a lot of movies we would not have been able to afford to see otherwise. Social and political activism was always part of our lives. Dad was not involved. It would not have been appropriate for an insurance company man to be openly political. Mother was much more open. She became politicized by hearing the stories from the miners in the boarding house. In my last year of high school, my Uncle Joe from Winnipeg came for a visit. He suggested I should go to to live with his family and go to university. I went to Winnipeg as a confused little guy. Winnipeg was a big city. 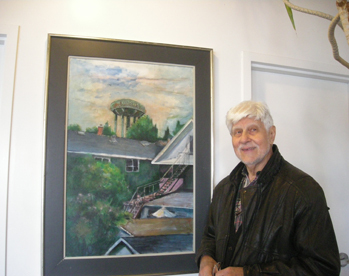 Oryst Sawchuk is an architect, urban planner and artist.